So what can you learn from a small hummingbird? Well, I got to learn quite a bit! A little back story, we (my dogs Clovis & Grace & my wife/muse Susan, and my camera) try to go for 1 or 2 daily walks. We have a routine route we follow. Last week, I had a neighbor, whose house we pass by, who has 2 fantastic ponds on his property. Anyhow, this kind gentleman stopped me on our walk and invited me to come on his land and photograph birds and such around his ponds. To me, this was a huge honor and I was very excited for the opportunity. I stopped by one evening to scoop it out. It was exciting. 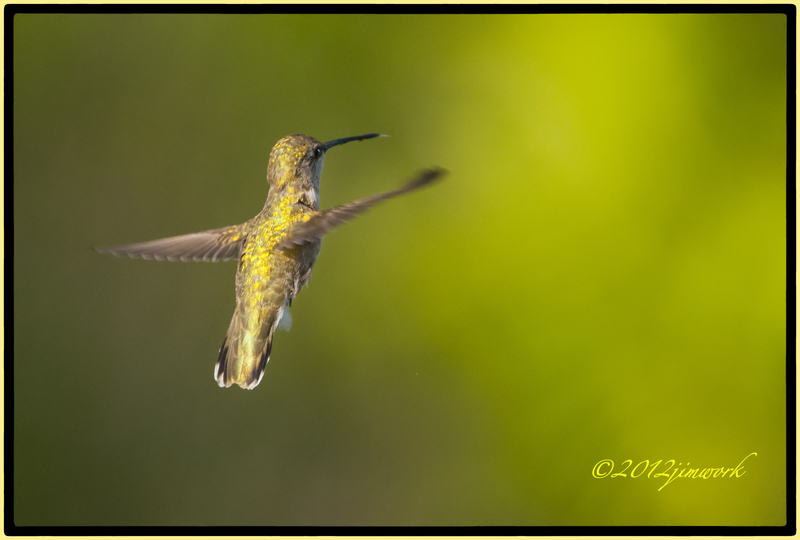 There were bunches of hummingbirds flitting back and forth. Swallows and other fly catchers that were diving into the water feeding. I decided to go early the next morning with my 500mm and gather all these preconceived images. I got there shortly after sunrise set up my portable blind and went to work. There were all the aforementioned birds flying about. I was like a little kid in a candy shop. My problem was, I had no plan of attack. My focus would quickly shift from trying to get the diving birds (I got a lot of images of ripples from the splashes). I would then get literally buzzed by a hummingbird and my attention would shift to trying to get one of these little gems in focus. My frustration grew at my inability to capture anything. This one lackluster image is the result of 3 hours of sitting in busy stillness and frustration. So, what did I learn? To have a true idea and focus as to what you are going to photograph. Try to stick to your plan and not go chasing everything that comes into your vision. I have always been proud with my to desire to “not chase the light”, to take what you are given. Just because it is an all you can eat buffet, you don’t have to eat more than you need to fill full.